Orijit Sen said he was "shocked" to see his designs "copy-pasted" on a Christian Dior dress. Orijit Sen was "shocked" to see a magazine cover with Sonam Kapoor wearing a dress resembling his work. New Delhi: An Indian designer has accused high-end fashion brand Christian Dior of copying his designs on a dress, in the latest of a string of claims by small-time designers that big fashion houses use their work without acknowledgment or permission. 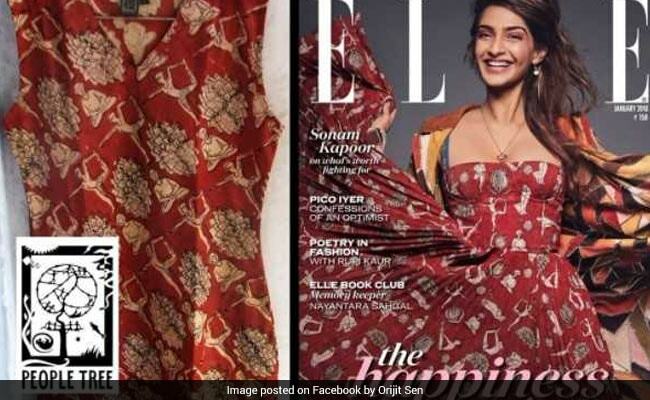 Orijit Sen, who said he penned designs of a man doing yoga poses in 2000 said he was "shocked" when he saw an Elle India magazine cover with Bollywood starlet Sonam Kapoor wearing a printed dress that resembled his work - down to the same yoga poses and color combination. "I couldn't believe they've copy-pasted my artwork and used it as part of an international collection," he said. Sen's yoga designs have been blockprinted on T-shirts and fabrics and sold for years by Indian clothing brand People Tree which has shops in New Delhi and the tourist hub of Goa. "[Christian Dior has] a hundred times the resources that we do and yet we are creating original work and they're stealing from us," said Sen, speaking over the phone. Christian Dior's dress bears a print that is remarkably similar, but that features additional yoga poses and flowers. The company did not respond to requests for comment. Sen is not alone. In 2016, at least 20 independent artists accused high-street brand Zara of copying their illustrations and designs on the brand's clothing. In 2017, a designer accused Kylie Jenner of stealing designs from her camouflage swimwear line. After he saw the Elle magazine cover, Sen posted an image on Facebook showing his design next to Christian Dior's and titled it "Unchristian Dior." The image has been shared widely on social media and fashion blogs in India. Sen said working with Indian artisans and reviving traditional crafts like blockprinting is at the heart of his work as an artist. His designs, he said, put a contemporary twist on traditional artworks so that artisans can remain relevant as fashion trends change. "This feels like a huge blow to the entire idea of supporting crafts," he said. "Despite making huge profits, big fashion houses don't think to give back anything. It's a generally exploitative situation. It's a big corporation feeding off smaller people," he said. Intellectual property expert Kiran Desai, a partner at Indian Law Partners said that India's copyright laws are weak and artists often do not know how to protect themselves. "None of these artists have the desire, or financial ability or time to take on the legal process," he said. Plus, he pointed out, copying happens in both directions - small Indian manufacturers often mass-produce cheap versions of runway collections. The problem is so increasingly rampant, that in 2017, top Indian designers Anita Dongre and Anju Modi started patenting their collections to prevent small retailers from reusing their designs. Sen said he is still deciding whether to take Christian Dior to court. "We've had many of our designs stolen in the past, but not by a fashion house this big," he said. "I can understand when other craftspeople do it, who don't have the resources. This takes that further, it's like being a parasite on artists."